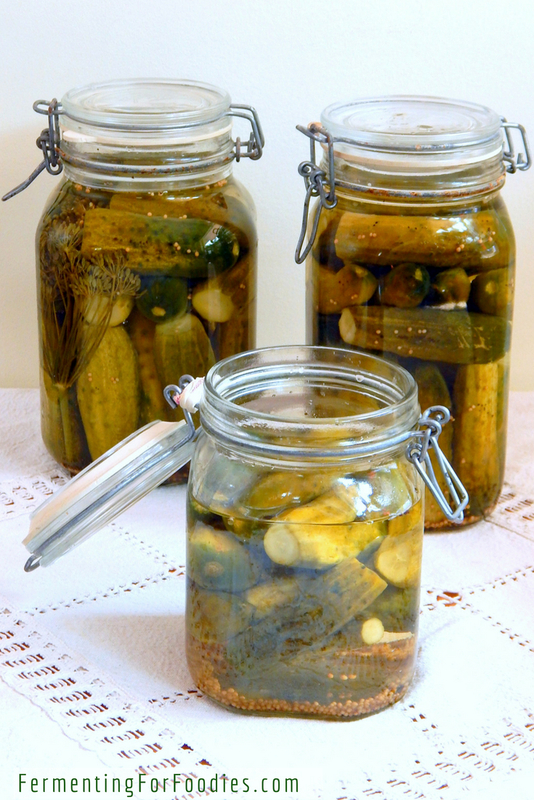 Fermented probiotic pickles are a delicious traditional-style cucumber pickle. They are really easy to make at home, and well worth the effort for every pickle-loving person. There are a number of different ways to ferment pickles at home, and all of them will result with an amazing tasting pickle. Here’s an overview of everything you need to know to ferment pickles in your own kitchen. There are lots of different ways of fermenting pickles. I do all of them regularly, mostly because we love pickles! Both open air fermenting and sealed fermenting work. So try out whatever set up will work best for you. Con: Open air fermenting requires a bit more work. You will need to check it every three days to skim scum off the top of the pickles and add water as it evaporates. Pro: It is easier for newbie-fermenters to try making a small batch of pickles in individual jars. Con: There is more risk of contamination with open air pickles. 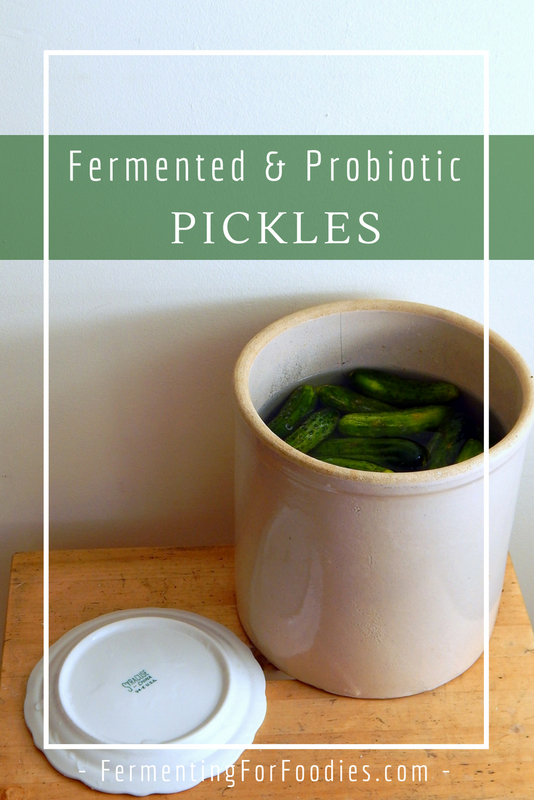 Mold growing on the surface of your fermentation crock doesn’t necessarily mean it will have affected the pickles… but it’s definitely a risk. Pro: Using a fermenting crock allows you to make a HUGE batch of pickles all at once. specifically designed for wide-mouth mason jars. Fermenting Crock: A fermenting crock is a large stoneware container with a weight to keep the vegetables submerged. It is the most traditional way of fermenting, and it has the advantage of making large batches of pickles all at once. They greatly reduce the risk of contamination. If you start with a sterilized jar, there isn’t any way for unwanted mold or bacteria to get in. You won’t have to remove scum, watch for mold or burp the jar. Just pack your vegetables and leave them in a cool, dark location to ferment. A fido jar is a flip top jar with a rubber seal. A good quality fido jar will be able to handle the build up of gasses during fermentation. I don’t recommend a low-quality fido, as they are mostly decorative and might shatter under pressure. turns a mason jar into a fido-jar like fermentation container. 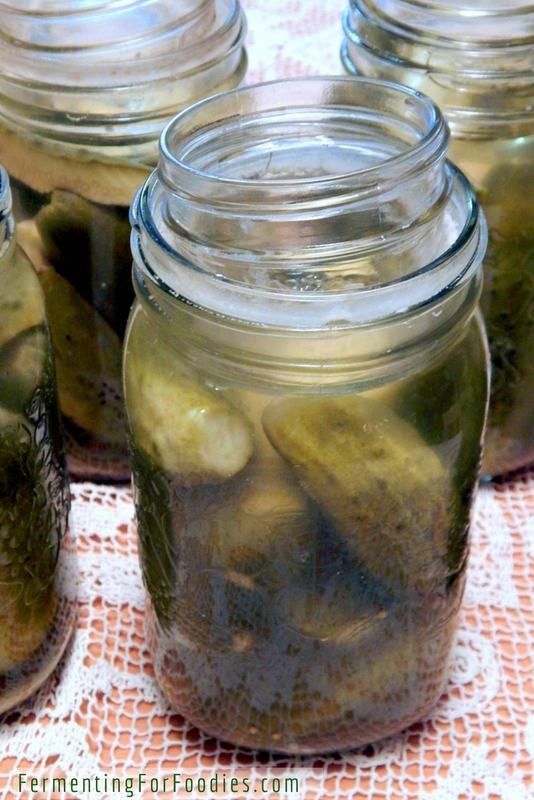 This probiotic pickle recipe will fill 2 mason jars. Feel free to scale it up if you want to make a larger batch. I usually do around 16 lbs of pickles each August to last us for the whole year. These fermented pickles will need to either be eaten or preserved within 2 months. If you want pickles that you can ferment for several months before eating, then I recommend my Grandma’s Fermented Pickle Recipe. Wash the cucumbers and trim ½ cm off the blossom ends to help prevent the cucumber from going soft. Cut larger cucumbers, as required, to fit in your fermentation container. Pack cucumbers into sterile fermenting container. Add in the spices, dill, garlic and pickle crisp. The recipe is scaled for 2 mason jars with 2 cloves of garlic, 1 sprig of dill, 1 tsp of spices in each jar. Combine water and salt to make a brine. 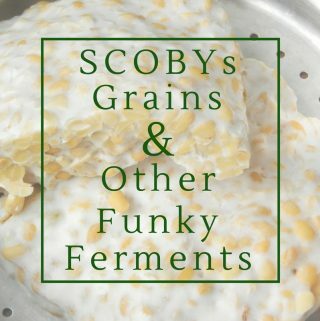 Allow to ferment somewhere cool and dark for 2-7 weeks. 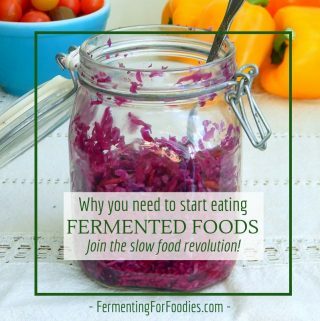 If you are doing open air fermenting, check every 2-3 days. Skim off the foam/scum and top up with non-chlorinated water as needed.
. You can also use a natural source of tannins: a grape leaf, 1 tbsp of grated horseradish root, or a pinch of black tea. -Pickles need to ferment for at least 2 weeks, and usually much longer to develop the full flavour. That also provides more time for your ferment to turn into a weird science experiment, so sterilize your jars before fermenting. 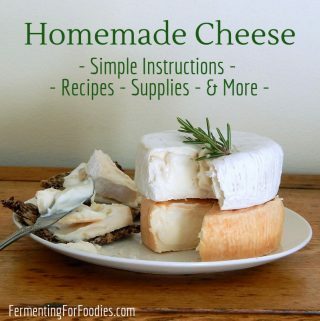 And if you are new to fermenting read the basic fermentation rules first. -Store the finished pickles in the fridge and eat within 4 months. Alternatively you can preserve them for long-term storage. 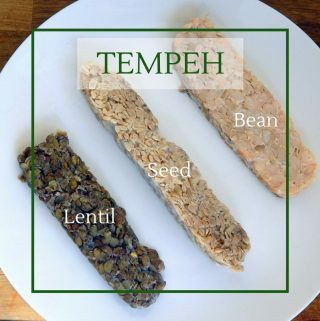 They wont be probiotic, but they will be deliciously authentic! Hi Emillie, how would you add in the pinch of black tea for crisp pickles? I actually just break open a tea bag. It works amazingly well! Just throw it in to the jar of pickles, and it will sink to the bottom.